I’m pretty sure the name Gruppo Italiano Vini, or ‘GIV’, will be unfamiliar to most readers. But in fact, GIV is without doubt the biggest wine company in Italy that nobody has ever heard of. Indeed, it is the biggest wine company in Italy full stop. GIV is a private company that operates 14 large wineries, literally across the length and breadth of Italy, from The Veneto in the north, to Sicily and Puglia in the deep south. But the company’s philosophy is to let the focus fall on each of its wineries as a distinct, regional business, and not to publicise the group or its central role. 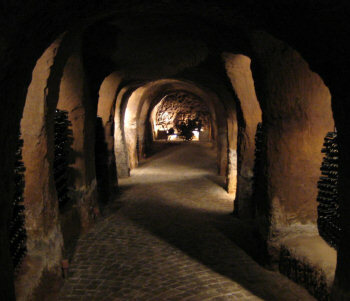 In total the group’s 14 wineries produce 85 million bottles of wine and it farms 1250 hectares of its own vineyards. This huge private company is also unique in Italy in that it is owned by two large co-operative cellars, Riunite & CIV, in the Emilia-Romagna region. I recently spent a whirlwind three days in Italy, visiting four of their main wineries (from north to south): Bolla in the Veneto, Melini and Machiavelli who make wines at the same facility in Chianti, and Fontana Candida in Frascati. Bolla is one of the region’s biggest and best-known names, making typical DOC wines like Valpolicella and Amarone. Like most of the companies that comprise GIV, I think it is fair to say that Bolla sits in the middle of the road in terms of quality, though as my tastings proved there are some excellent wines in this portfolio. I met up with oenologist Luca di Palma and agronomist Gianantonio Marconi at their large winery that is also the research and technical HQ for the whole GIV group’s northern operations. 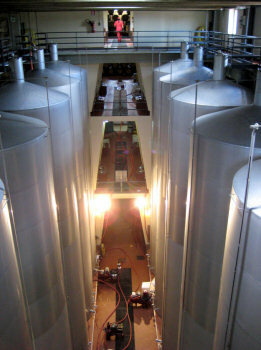 Right: the scale of these tanks is given by the worker in red overalls on the fourth level. Though founded in 1883 by Abele Bolla, The Bolla operation belonged most recently to the American company Brown-Forman, owners of Fetzer and Sonoma-Cutrer amongst others. GIV completed the purchase of Bolla in 2008, with excellent US distribution in place. 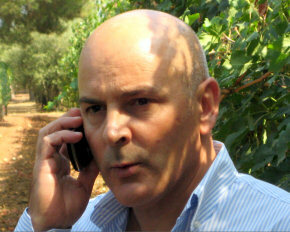 Gianantonio tells me that since then the emphasis has been on the vineyards. Although working with the same growers that have been supplying Bolla for decades, there have been radical changes to the management of vineyards and technical assistance that growers receive. There are many more meetings between the growers and expert staff from Bolla cellars, tighter technical controls on quality and new systems of reporting in place so that Bolla can monitor and update its family of growers on controlling any problems that arise. Gianantonio says “Early and efficient action can cut down on blanket use of synthetic pesticides and treatments.” One example of this is a move to using pheromone traps to capture insects and analyse their breeding patterns, so treatmentscan be developed to disrupt these. Bolla has growers in over 100 districts of the Verona area, which Gianantonio says gives a lot of flexibility as well as more options in tough vintages. They also have integrated operations with GIV’s other two cellars in the area, the volume producer Lamberti and the high-end estate of Santi, bringing more flexibility and cost savings. At the time of my visit a vast new bottling line was being installed. Oenologist Luca di Palma tells me that the groups new quality controls required that the line be replaced. In terms of the current vintage, it is “like 2003” according to Luca, with a very late spring but then very hot summer, so a short growing season that has really suited whites. Some sunny days and cool nights where being prayed for in order to ripen and improve colour depth in the reds. See all stockists of Bolla on wine-searcher. These two estates in the Chianti Classico zone are, to all intents and purposes, run together. Between them they cover 544 Hectares of land, with 180 hectares under vine. Under GIVs ownership almost all of these have been replanted with new clones, mostly of Sangiovese, in a rolling programme. Melini has four farms, each operated independently, covering both Chianti and Chianti Classico zones. Some Cabernet and Merlot is grown for IGT wines, and sometimes for blending into Chianti wines. Whilst this move is intended to allow more reliable commercial products at slightly lower prices, Marco Galeazzo expresses concern: he and GIV think the changes runs the risk of Chianti losing its identity. “It could become a homogenised red wine that might appeal to the market,” he tells me, “but will it still be Chianti?” He will continue to limit non-Sangiovese grapes to around 15%, even after the changes are in force. Even in the Maremma (the “Eldorado of Tuscan wine” according to Marco), grapes this year are selling for 25 cents, when one euro is really the lowest viable price for growers. The market is extremely difficult, and even in the Maremma some younger generations of family growers might abandon their vineyards. Meanwhile, GIV shows confidence in the region, and last year five million Euros was invested at the large vinification center at Melini, which is their technical centre for the region, much like Bolla in the north. See all stockists of Melini on wine-searcher. My visit to Fontana Candida was the final and most southerly point of my trip, with their vineyards in the Lazio hills west of Rome. It turned out to be a fascinating visit, not just because there are some terrific top-end wines here that are pushing the Frascati envelope, but because of some candid comments made by Mauro Merz, Director and Oenologist, about selling to the large UK supermarkets. Fontana Candida was acquired by the GIV group in the early 1980s, and lies on the site of an ancient fountain, hence the name of the winery. It produces six million bottle annually, and there are wonderful old cellars beneath the winery carved from tufa, now used to age the top wine, Luna Mater.In the heart of the Frascati DOC with beautiful views over to Rome, the dome of St Peters visible in the distance, about 90% of production is DOC wine (Frascati was one of Italy’s first DOCs, declared in the 1960s). The soil here is volcanic and naturally healthy, needing little by way of treatments. It is very permeable soil with good drainage and high ash content. The climate is mild, with proximity to the sea giving constant, delicate breezes. Malvasia di Candia and Malvasia di Lazio are now the in vogue grapes, the use of Trebbiano declining rapidly – that is a policy of the Frascati Consorzio too. Like the other GIV properties, there have been significant quality initiatives here, including identifying a clone of Malvasia di Candia from one of their growers, which has since been replanted extensively in their vineyards. For the past three years a full time agronomist has worked exclusively with their grape suppliers. Noting that their young, fresh wines were all in cork or synthetic closures, I asked Mauro about screwcaps and learned that for now these are outlawed by the DOC regulations, but there is a proposal that they will be permitted from the 2009 vintage. The big supermarkets are notorious for the hard-nosed deals they negotiate with suppliers. This is not a situation that is confined to just one or two larger players, and indeed it is not a problem unique to the UK. But it is unusual to have a winemaker who is happy to speak about it on the record. “This pressure on prices means we will struggle to push through our quality initiatives,” says Mauro (left), “especially our ability to pay our growers a premium for high quality: if there is no demand for high quality, how can we continue to pay growers higher prices?” With the proximity of these vineyards to Rome, Mauro fears many small growers might rip out vineyards and turn to developing property instead. 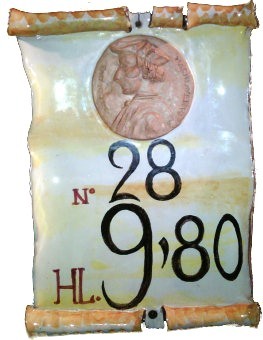 See all stockists of Fontana Candida on wine-searcher.